One may or may not have ever noticed them since their rustic and weather-worn exteriors tend to camouflage them into their urban backgrounds but if for some reason you have, they probably just resemble old weather-beaton old bird perches. These hidden relics were part of our city and Country’s state of the art Civil Defense System that was first developed and installed shortly after the attack on Pearl Harbor during the onset of World War ll. 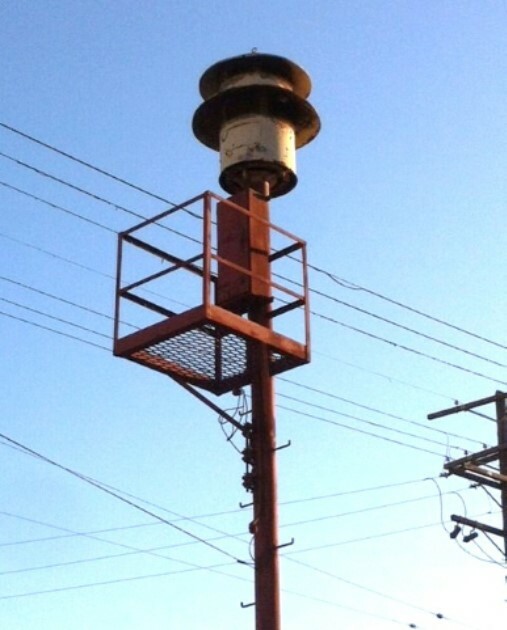 According to air raid siren hunter Dennis Hansley, approximately two hundred and twenty-five of them hung, generally in high locations, throughout our city. After the war ended, they were turned off for a period of time but even that was short lived, when in 1949 the Soviet Union tested their first atomic bomb. These old metal civil defense reserves plus an additional 165 newer ones were called back into duty, as they were reconditioned and updated to make another tour of duty. This event also marked the beginning of the “Cold War” between the United States and Russia and as those who can remember will attest, these sirens were tested every third Friday of the month at 10:00am. As a young boy, I distinctly remember being out on our school’s playground at that hour and looking up as they began to sound with a long steady howl. I never really knew where the sound came from but it was loud and distinct enough to make one pause for a moment and think. The signals came in two patterns, one was a long steady crescendo alert and the other, a short 3-5 minute wavering signal. They were paid for by our Federal Government and maintained by local municipalities. In Los Angeles the County Sheriff’s Department were assigned to monitor, test, and maintain them. Although these historic guardians of our city never had to be officially called into action, some historians still recall an alleged attack by Japanese planes on our west coast as the Battle of Los Angeles or the Great Air Raid of 1942. On the early morning of February 25th 1942 as most Santa Monica residents slept, the air raid sirens began to howl followed by an hour of chaotic anti-aircraft fire. Five people died that night, three from car crashes and two from heart attacks during the night time blackout. Initial Military reports stated that as many as fifteen enemy planes had been approaching our coast. Later reports downgraded it to three launched from a submarine. Ultimately the more realistic explanation may have been a combination of the deep war hysteria and an errant meteorological weather balloon. In 1979 John Belushi starred in the movie comedy 1941 based on this event.